A slender surrealist staircase of concrete and glass has been created by ABT. It is only about five centimetres thick, but the staircase spans nearly six metres without supporting ribs. 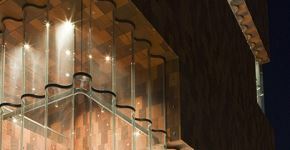 The glass balustrades, which are connected invisibly to the stairs, enhance the illusion of weightlessness. Together, the concrete and the glass create a strong, hybrid structure. The staircase demands the utmost from the materials used and from ABT’s craftsmanship. 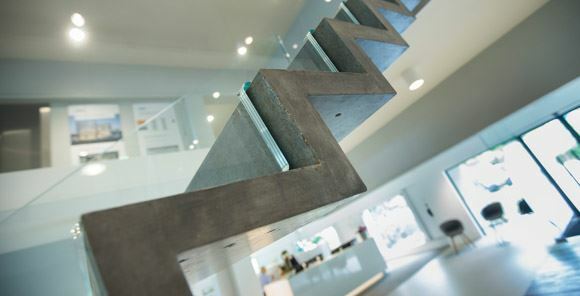 The staircase, which is intended for ABT’s headquarters in Velp, was designed by JHK Architecten. It is made of a single piece and is four times thinner than usual. To make the staircase so slender, the concrete and the glass have to cooperate in creating the structure: the glass is bonded to the concrete, adding both rigidity and strength to the stair. Without the glass, the stairs would behave more like a springboard. ABT used special software to calculate the details of the structure. Because of the extremely high tensile forces in the staircase, ABT chose self-compacting ultra-high performance fibre-reinforced concrete and a special cement. The reinforcement ratio is very high. 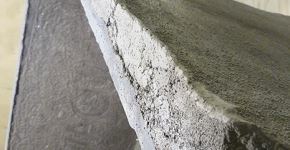 Pouring the concrete was particularly difficult because the staircase is so slender: the viscous reinforced concrete had to fill a mould that was just five centimetres deep, which required an innovative pouring process. In particular, dispelling the air at the bottom of the mould required unconventional solutions. Special air channels in the casing and a very fine-meshed compacting technique were the key. The staircase was poured in the Romein Beton factory. The glass balustrade reflects ABT’s innovative nature. The team was taking the material to its absolute limits. A triplex panel runs along the corners of the steps, meaning a glass structure was needed with a sawtooth pattern plus high tolerances, a combination that is rarely if ever seen. Close collaboration with architectural glass manufacturers Si-X initiated a search for the right production methods. 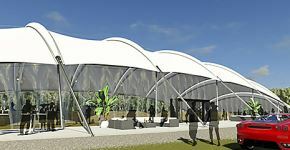 The architect also opted for invisible connections, a dream demand for ABT’s glass specialists. 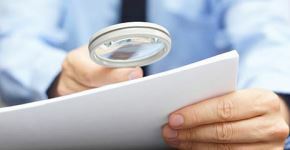 A long search yielded an invisible joint consisting of steel strips that were prefabricated and bonded onto the glass. Small notches on these steel strips were bolted almost invisibly onto the concrete from underneath. Thrillingly exciting strength tests showed that the strength of the joint exceeded all expectations. 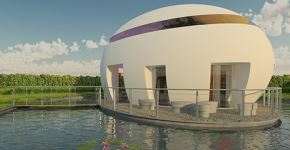 The structural design required close cooperation between the glass specialists and the concrete makers. It was more than a question of matching up the forces in the reinforcement and the glass. A number of practical issues turned up as well, for example how to cast dowels of the right tolerance in a slab of concrete of about 5 cm thick. For technical reasons related to production, it was finally decided that the dowels should be drilled in afterwards and glued into the concrete. This graceful staircase goes way beyond everyday limits, both in the production techniques and in the calculations. The revolutionary design is a demonstration of the possibilities when UHPC and glass are combined: UHPC has proved to be a material that is versatile in its applications, even in thin slabs, and it needs virtually zero maintenance. Glass provides inspiration as a load-bearing structural material that can now even be bonded at its ends to all kinds of other materials, such as UHPC. ABT foresees a great future for UHPC and glass.